Do you keep your important files in the trash? At a recent industry event, I had the opportunity to share some "war stories" over lunch. One of the guys at the table told a tale of an email server crash on a Friday night that one of his techs rescued after many hours of effort late into the night. The Microsoft Exchange server had crashed, and they ran recovery and clean up tools to get the mail running again. Mission accomplished! Until Monday morning when they received a frantic call from the customer reporting missing mail! After a few questions, they figured out that the missing mail was from the "Deleted Items" folder, which had been cleaned out as part of the best practices for getting the mail up and running again. This turned out to be a major problem, because the user was actually intentionally storing important mail in the "Deleted Items" folder. The funny thing is that all of us at the table had heard this before from other sites over the years, so this wasn't an isolated incident. If you happen to be one of these users who keeps important files in the trash, stop! Storing valuables in the trash doesn't make sense. You wouldn't keep your important paper files in a trash can and get angry when the cleaning service emptied the trash, and it doesn't make sense to keep your electronic files in the electronic trash. Thinking about this dilemma, it seems that the users who do this may want to segment their mail between what has been read (winds up in the trash) and what still needs follow up (stays in the inbox). What may be occurring is that the users don't know that you can create folders in your mail, just like you can with your regular files. Creating folders is the right way to organize your mail. 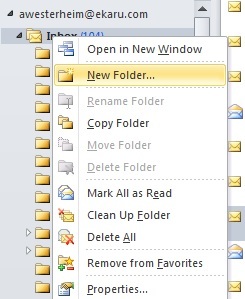 To create a subfolder in your Inbox, right click on the Inbox and select New Folder. You'll then have the option to name the folder whatever you want, such as "Important Stuff". As for your Deleted Items folder, the contents will remain in this folder until you empty the contents. 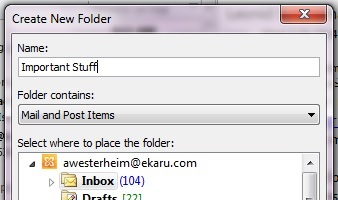 You can do this by right-clicking on the folder, and select "Empty Folder" from the pull-down. Its a "best practice" to keep this folder (and all your folders!) free of clutter. To organize your mail, you can create as many folders as you want. Think through a plan that works for you such as organizing by client account, or vendor, etc, but don't leave it all in your inbox, and don't use your "trash" for storage!